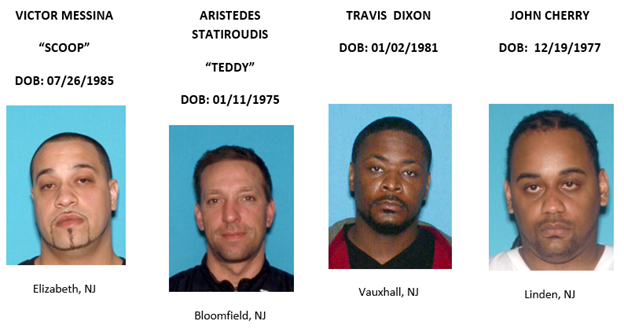 Twenty people have been arrested and significant quantities of cash and multiple types of drugs have been seized as the result of a nearly yearlong investigation into a multi-tiered narcotics distribution ring operating throughout parts of North Jersey, acting Union County Prosecutor Grace H. Park and Linden Police Chief James Schulhafer announced Tuesday. Seized at the various locations, which included sales sites and stash houses, were approximately $116,500 in cash, plus approximately 4.5 kilograms of MDMA (better known as “molly”), 60 grams of crack cocaine, 140 grams of cocaine, 140 grams of heroin, 14,000 counterfeit Viagra pills, and more than 100 bottles containing a cumulative total of more than 10,000 units of various prescription pills – not only did this mark the largest seizure of prescription pills in Union County Prosecutor’s Office history, but it also eclipsed the cumulative total of the number of pills processed at the Union County Forensic Laboratory from 2011 through 2013. Altogether the drugs had a combined estimated street value of more than $525,000, and during the execution of the search warrants, two handguns and four vehicles (an Acura MDX, a Chevrolet Tahoe, a Mercedes-Benz sedan, and a Jeep Grand Cherokee) were also seized. In addition to the Union County Prosecutor’s Office and the Linden Police Department, other agencies assisting in the investigation and the executing of search warrants included the Berkeley Heights Police Department, Bloomfield Police Department, Clark Police Department, Elizabeth Police Department, Essex County Prosecutor’s Office, Hudson County Prosecutor’s Office, New Jersey State Police TEAMS (Tactical Emergency and Missions Specialists), Newark Police Department, Rahway Police Department, Roselle Police Department, Roselle Park Police Department, Union Township Police Department, Union County UCERT, Union County Police Department, Union County Sheriff’s Office, and the Westfield Police Department.